After nearly four decades at the private Salt Lake City college, Stephen Morgan to step down following school’s the 2018 commencement ceremony. (Courtesy of Westminster College) After serving nearly 37 years at Westminster College in Salt Lake City, president Stephen R. Morgan has announced he will retire at the end of the academic school year, June 2018. Westminster College President Stephen Morgan announced Friday he will retire at the end of the 2017-2018 school year. Morgan, 63, became the private Salt Lake City college’s 18th president in 2015, but has served at the institution for 37 years. A spokesperson for the college’s board of trustees said it will launch a nationwide search to replace him, with a successor expected to be in place by the summer of 2018. During his tenure at Westminster, Morgan served as an auditor, treasurer, executive vice president and vice president for institutional advancement, advising six past presidents on major campus decisions since 1981. Before becoming president, Morgan was instrumental in the growth of Westminster’s endowment to more than $75 million. 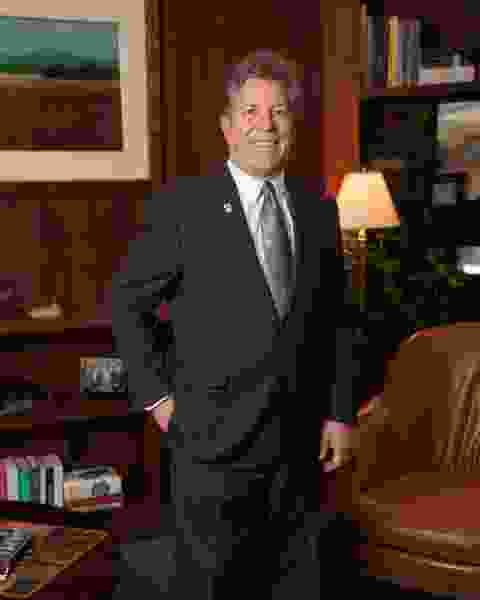 He also led fundraising efforts for major campus construction projects, including the Giovale Library, the Bill and Vieve Gore School of Business, the Meldrum Science Center and a host of other facilities. While president, the Westminster created a new Honors College and hired a new chief diversity officer. The college’s athletics programs also moved into the final provisional year of NCAA Division II. Jeanne Ambruster, chair of the college’s Board of Trustees, said Morgan’s leadership, diverse experience and positive outlook will be missed on campus. Morgan received a bachelor degree in accounting from the University of Utah and is a certified public accountant . Steve’s wife Sandy and their three children are all Westminster graduates.